Another Goodbye. My chancellor (to my mind the only Chancellor I knew and would care to know) died this past week. The notice to the University committee was delivered in this morning’s emails. As I age, I grow weary of the inevitable good byes to those who have traveled with me. 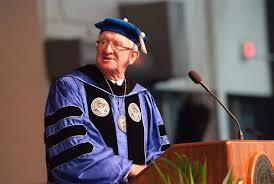 Chuck had retired several years ago after having served the University of Wisconsin-Stout for twenty-six years. During his tenure the campus was transformed: no, that construction is too passive. Chuck’s vision transformed the University. Though he and I didn’t always agree on the meaning of a university education or of education in general, he always listened with interest and respect.Occasionally he agreed with me. I understood the work he undertook and that he accomplished at Stout: the University was forever changed during his tenure in a way that affected daily the lives of faculty and students and I suspect altered the lives of those who were fortunate to share the time with him. And I respected the work that he did and that he made possible for us. I don’t remember how we met or became friends. We once shared a somewhat short-lived book group; we both held long-standing subscriptions to The New York Review of Books and shared the articles and book recommendation. He complained to me that too often his edition din't arrive and we joked that the journal might not have believed that more than one subscription belonged to this town in rural Wisconsin. Chuck was trained as an historian (ah, he will have his place in Stout’s history); his dissertation we joked, studied some obscure condition in colonial Connecticut. We both had interest in the Puritans and in current politics. Chuck was a liberal in the best sense, and for too many years we mourned the directions our country moved under the course paved by incompetent and ignorant leaders. We read Tony Judt together, and mourned his death; later I sent Chuck a yet unread book (by both of us) by Charles Taylor. He didn’t read much fiction until later in his life, but he allowed me to grandly discourse on the novels and cultural critics I read. He once invited Ted Sorensen to the campus and to him introduced me as ‘the last Marxist on campus.’ I was honored. Every other month or so we would meet at a drinking establishment and share bottles of wines and wonderful conversation. Chuck knew good wine and he was generous in sharing it. He invited me often to his Holiday parties, and when I would enter he would pull me aside and whisper that I should inform the bartenders to pour from the bottle kept behind the public offering. The reserved bottle was from his wine cellar—a construction he stocked copiously and with great pride took me down to peruse and partake. We discussed always our work, our ideas and our lives. Chuck never took himself too seriously. Once over a bottle of wine he told me a story with which he identified. The story came from a chancellor at another University, one larger than Stout, who at a conference and over drinks told Chuck that sometimes he would stand at the windows of his office overlooking the campus and say to himself, “I wonder what the hell is going on out there!” Chuck loved that story, and I remarked to him that his office had large windows. It produced for both of us an ironic and satisfied laugh. One other thing we shared was heart disease. Chuck had bypass surgery a number of years ago and later had a pacemaker installed. His health declined, and the last time I saw him he walked with a cane. Then after he retired he moved with his wife, Toni to Florida, and we were reduced to sharing emails. In the telegraphic nature of these communications we shared our despair over the state of the nation. We worried for our children. Last week Chuck had a stroke and on Friday he died. And now I grieve alone and mourn his loss. Remarkable. But perhaps not surprising. Today Trump repeated his call for arming teachers with concealed weapons as a way to fight school violence. Not gun control but gun proliferation is his illogical, bizarre solution! This policy from a man who has no notion of excess. Aren’t guns for Trump just another metaphor for his hands that as he bragged in one of the debates were big—as was other parts of his anatomy—hint, hint! Reported in The New York Times, Trump said, “I want certain highly adept people, people who understand weaponry, guns” to have a permit to carry concealed firearms in schools . . .” I wonder who it would choose those “highly adept people.” I suspect that Trump and his administration might turn to the NRA. And as an incentive to teachers to carry concealed weapons Trump suggested that teachers who were qualified to handle a weapon — Mr. Trump estimated that this might amount to between 10 percent and 40 percent of teachers — would receive “a little bit of a bonus,” Does Trump even know how many teachers there are in our schools? In the Fall of 2017 in the public schools in the United States there were 3.2 million full time teachers! 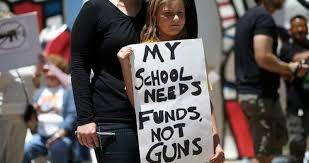 That is between 320,000 and 1.28 million weapons in the schools! Trump would devote federal money to training these teachers. “I want my schools protected just like I want my banks protected,” the president said. This would be scanned! Trump’s statement reveals a depth of stupidity that every morning awakens me with terror. Trump’s equating the contents of a bank—money—with the content of the school—children and adults—is remarkably absurd, though no more absurd than much else that Trump has spoken in the thirteen or so months he has been in office. I can understand why Trump would want his banks protected, but how does he imagine that arming teachers would prevent further school violence. Interestingly it isn’t the workers in the bank that Trump would protect: it is his money! But it would seem to me that unless the now-armed teachers were trained marksman (from where in the budget would money come from to train them) wouldn’t it be tragic if the teacher would miss the shooter and hit a student or fellow armed teacher who was shooting from the other direction. What might students feel knowing that the teacher in front of them wears a concealed weapon? Certainly, classroom management would achieve a new and frightening register!! Pre-service teachers would now enroll at shooting ranges rather than into classrooms and would be rewarded for their marksmanship rather than their knowledge of material and pedagogy. It is no surprise that a man who does not read—and maybe only barks at a few words when print is actually placed before him—would offer teachers bonuses for their marksmanship but not for their intelligence and expertise to facilitate learning. Not higher salaries for the remarkably difficult work of the classroom, but bonuses (monies for ‘extra work’ that really has nothing to do with a teacher’s work). This is an administration that takes money away from the public schools and leaves those schools resource deprived. This is an administration that governs by tweets and gathers much of its information from Fox News and that holds education in contempt. This from a man who governs by ridicule, intimidation, bluster and lies. Daily this administration terrorizes us with its cruelty, cravenness, and absurdity. I do not think there is anybody governing this country at present. I am concerned for the children. I am worried about the earth. And I am fearful for our survival. In the program notes for Mozart’s Symphony No. 31 in D Major, Paris, part of a wonderful program of music at a recent concert by the Minnesota Orchestra, I found the following statement intriguing: “In structuring the symphony, Mozart omitted the minuet movement, which was not yet accepted in Parisian symphonies, and kept the harmonic scheme simple throughout.” I could not help but wonder to whom the minuet movement was anathema, and why it might be so? Joseph Haydn is credited with giving the tradition of a dance-like third movement--either a minuet (based on the old courtly dance) or a scherzo (meaning “joke”-- a quick, often lighthearted tune: see my own Symphony #1 in a Minor Key: a Meditation on Time and Place, and especially Movement 3) for the four-movement symphony. Mozart’s Paris symphony contains only three movements. I am not an historian of music or a music archaeologist (an unearthed symphony by Henri-Joseph Rigel opened the program: the Friday and Saturday concerts were the first performance of Rigel’s work in the 115-year history of the Minnesota Orchestra!) Rigel, though German, wrote in Paris. The program notes by Michael Adams, for thirty years a member of the viola section of the Orchestra, notes that Rigel’s music is especially notable for its “Sturm und Drang” style . . . a movement popular with Parisian audiences who favored bigger orchestras and more dramatic music. Sturm and Drang translates to Storm and Stress. Rigel (1741-1799) would have composed during a part of the same time period as did Mozart (1756-1791), and though Rigel was German he seemed to understand French tastes in music. Rigel’s Symphony No. 4 in C minor also has only three movement, omitting the third movement minuet or scherzo. 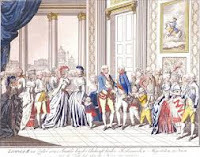 Perhaps the light-hearted minuet or the humorous scherzo was not appealing to the Parisians who desired greater drama, Sturm und Drang, in their music. I guess what I am wondering is what it might mean that the dance-like (or joke-like) third movement was not yet accepted in Parisian symphonies. Accepted by whom, I wondered. Of whom were the Parisian audiences composed? Who would set the standards by which composers and their compositions were measured. What was wrong with the minuet or scherzo? Of course, the answer to these puzzlements is hegemony. I understand hegemony to mean ideology normalized. The idea that the discoveries of science equate to truth might be hegemonic, as might be the idea that gun ownership is a civil right guaranteed by the Constitution. Hegemony teaches that home ownership is available to everyone and is preferred as domicile choice, and that justice is, indeed, blind. Etc. Hegemony makes the every day reality look as it does and makes what is lived seem to be the only possible existence. Those in power use hegemony to maintain their power by normalizing the reality in which they have power and by which that power can be maintained. Hegemony determines what might be acceptable and what might not be so, and it also establishes by whom acceptability might be asserted. In an interesting essay in a recent London Review of Books, “Merely a Warning that a Noun is Coming,” Bee Wilson notes that as British soldiers returned from World War I “swearing became normalized, but it was only acceptable when used by men and addressed to men.” Women who did swear were socially and sometimes legally disciplined. What this reveals about British society beliefs about women and language is an instance of hegemony! Of course, it was men of a certain social class and standing who determined the standard. 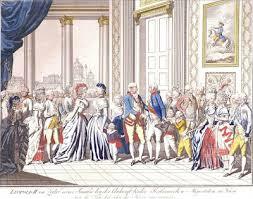 So, I wonder who attended concerts in 18th century Paris? I look about me in Orchestra Hall—that night every seat was occupied, though I think they were in the Hall mostly for Fauré’s Requiem—and wonder who they might be (who am I?) and what to us would be deemed in music acceptable. I know that cultural historians might offer some explanation for the Parisian’s preferences: did the Sturm and Drang music prefigure the Revolution? And I wonder what today makes the extensive corruption of the Trump Presidency acceptable to even a small portion of the American public? What permits this population to excuse, to ignore, or to reframe the actions of a bunch of mostly venal, very wealthy and incompetent men and women into some notion of acceptability.